Until recently, I hadn’t given much thought to what it actually means to have 20/20 vision. Like most people, I assumed that 20/20 vision was just a synonym for “perfect” eyesight. But when I recently spoke with optometrist Graham Erickson, a sports vision specialist, I realized that there is an entire medical field devoted to optimizing vision for athletes – so that they can see better than 20/20, perhaps even 20/8! In fact, 20/20 vision just means that you can see an object 20 feet away as well as the “average” person. while an offensive lineman may need to split his attention between central near vision (controlling his man) and peripheral vision to pick up shifts by the defense. Since it’s estimated that 80% of the information we take in (while playing sports) comes from our eyes, even slightly blurry vision can dramatically affect performance. Even though there is a lot that athletes can do to improve their visual skills, very few competitive athletes get annual comprehensive eye exams. In my latest Healthy Vision episode, NBA star Tyreke Evans* offered a call-to-action to his peers regarding regular check ups, and World-Champion female sprinter Allyson Felix spoke to me about the role that good vision has had in her success. In summary, I learned from Dr. Erickson and Allyson Felix, that eye fitness is a critical part of competitive sports, but unfortunately something we often don’t think about. There are new training programs that help to develop peripheral vision skills that may reduce the risk of being blind sided in football or hockey games, and can therefore reduce concussion risk. Athletes should seek out an eye care professional who specializes in sports vision in order to optimize their visual potential. The American Optometric Association’s Sports Vision Section offers a doctor locator to help patients find sports vision experts in their area. Please check out the website here (or their Facebook page) for more information. 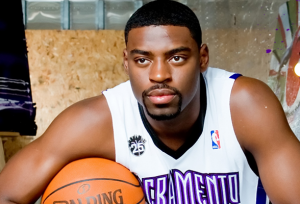 *You can find out more about Tyreke Evans and the importance of eye exams at facebook.com/vspvisioncare.